Bailey Chiropractic Centre proudly offers KOOL 'N FIT® products. 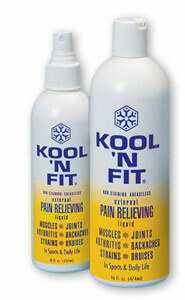 KOOL 'N FIT® Pain Relieving Liquid is the proven, all-natural spray containing over a dozen herbal ingredients. Just spray it on (no rubbing needed) and feel its deep penetrating action do its work, giving the user an effective pain relief without inflammation or irritation of the skin. By stimulating blood flow, relaxing tight muscles, and its cooling action, KOOL 'N FIT® Pain Relieving Liquid invigorates, relieves cramps, restless legs, and creates a feeling of well being. These unique qualities make KOOL 'N FIT® Pain Relieving Liquidsafe and effective in relieving arthritis, backaches, bruises, strains and sprains, and other problems - degenerative, chronic or temporary. In fact, KOOL 'N FIT® Pain Relieving Liquid often is effective where other analgesics are not. The product is further distinguished by its easy to use, NO-TOUCH, spray application which works at any angle, even when the bottle is held upside down. Unlike other external analgesics, KOOL 'N FIT® "Pain Relieving Liquid" is a clear, non-greasy, non-staining, and all-natural liquid which is applied from an environmentally safe pump spray bottle. KOOL 'N FIT® is the "Original Pain Relieving Liquid." Most external analgesics are formulated with a single active ingredient, usually a salicylate or capsaicin. Some also contain a second active ingredient. KOOL 'N FIT® "Pain Relieving Liquid", on the other hand, contains many all-natural ingredients and essential herbal oils which are beneficial for the user. Please contact our office at (336) 889-8585 for pricing and to order.